In 2019, 105.2 million people in the US will use an iPhone, giving Apple a 45.2% share of the country’s smartphone market. That share will grow 0.1%each year through 2021. Android will continue to dominate the US smartphone market, having overtaken Apple in 2011. This year, Android usage will grow 3.3% to 124.4 million people. 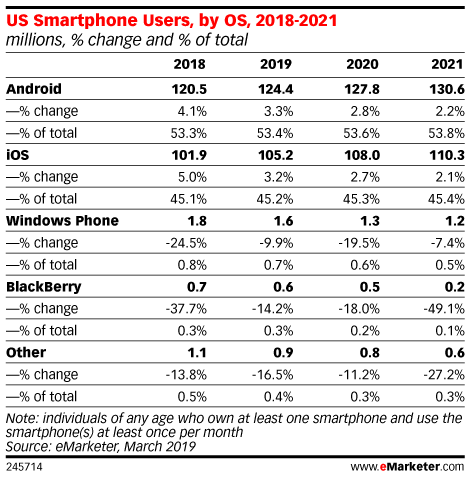 Its share of US smartphone users will increase to 53.4% in 2019, and reach 53.8% by 2021. Read the rest at eMarketer.